(NSN 6135-01-440-7774, NATO stock number Z8/6665-99-760-9742). This adapter is being sold as a commercial part, but is identical to Rockwell Collins p/n 221-0135-020 (NSN 6160-01-385-4358). 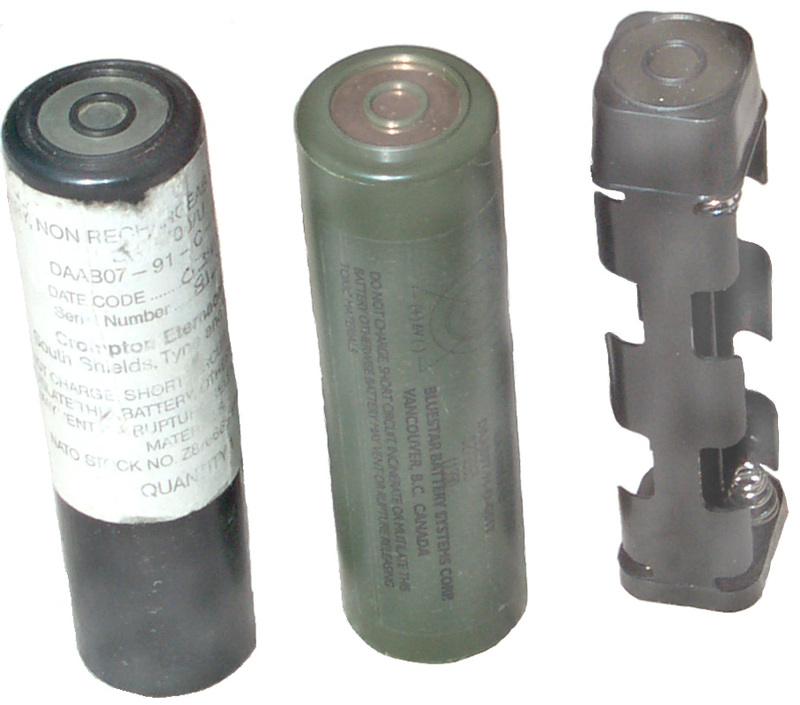 There are two diodes used to combine the two strings of 4 "AA" batteries. These diodes prevent any charging current from reaching the batteries in the holder thus preventing charging of Alkaline cells as a safety measure.. 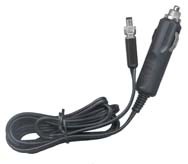 This adapter can NOT be used for charging applications. The Rockwell Collins AN/PSN-11 PLGR GPS receiver (HNV-500C) is the most common place the 5800BA adapter is used, but it also fits other applications. These are in stock and typically ship within 1 business day of payment receipt. The 5800BA can be used with either 4 each "AA" cells or with 8 each "AA" cells. The BA-5800/U is a LiSO2 chemistry battery with a capacity of about 44 Watt Hours. If 8 Alkaline "AA" cells are used in the adapter the capacity will be about 34 Watt Hours. If 8 Ni-MH batteries are used (2.25 Amp Hour type) the capacity will be about 22 Watt Hours. The life cycle cost of using rechargeable batteries is much lower than using primary batteries, but at a higher initial cost. Of course the capacity changes with the current drawn from the battery, it's not constant, so there are just ball park numbers. CAM - but the stock adapter does not work, one modified as shown below may work. The CAM requires a battery that is less than 1.4" in diameter. The stock BA5800 battery adapter is 1.445" across the diagonal when all 8 batteries are installed. With only 4 "AA" cells installed it's 1.410 and will fit, but then does not have enough current capability. With 4 "AA" cells in a square pattern the maximum diameter circle that will enclose them is 1.398" which would fit the CAM battery compartment, but this would require a new battery adapter design optimized for this very compact size or a mod. Two slots have been Moto tooled to allow the batteries to touch each other and the "ears" have been slightly thinned. This modified adapter measures <1.4" O.D., but it has not been tested in an application. Once this modification has been made the adapter is very weak and if stored under compression, like in a PLGR, will distort. Note that the Trimble p/n 13828-00 "AA battery Adapter" battery box accepts a BA-5800 but a BA-5800 will NOT power the Trimble receiver. The Trimble AA holder that fits the box looks very much like a BA-5800 battery adapter, BUT instead of having two concentric rings as the contacts it has two contact pads about 0.25 x 0.375". In order to get these small contacts to line up with the mating spring fingers the battery holder has a flat. If concentric rings were used there would be no need for an alignment flat. The reason for this non standard construction is that the Trimble battery holder connects all 8 AA cells in series providing a nominal 12 Volts with Alkaline cells. The Trimpack is rated for 8 to 32 Volts. When you try and run a Trimpack (p/n 14992-20) from a BA-5800 or my adapter you will get a "low battery" warning and the receiver shuts down. The reason for the strange contact pads may be to prevent someone using the Trimble adapter in a PLGR or other application expecting a 6 Volt BA-5800. The PLGR uses a threaded plug for it's 9 to 32 Volt external power connection. 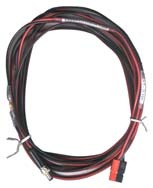 Can be used to make up your own cable. Cigarette Lighter Plug to PLGR cable. Comes with 5 Amp fuse in in the hot lead and LED power indicator to confirm you have a good fuse and a hot Cigarette Lighter socket with the correct polarity. So plug in the cable first and check the LED, if it's on then connect the PLGR. * Reversed polarity at the Power Pole end. * Mistakenly connecting to the "Hot" 12 Volt battery in a 24 Volt system and then connecting a grounded antenna or data device to the PLGR. There's also a diode across the PLGR connector as part of the reverse polarity protection. If you use this option be sure to include what you are ordering and a legible return address. page created 17 Apr 2003.